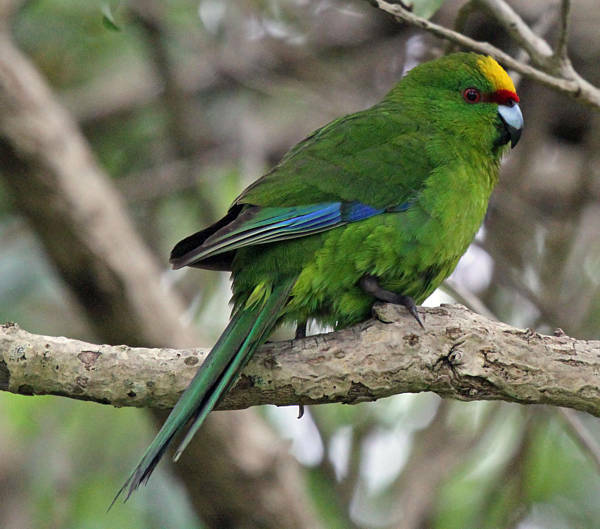 Two species of kākāriki or parakeet were once very common on mainland New Zealand. In fact they were so common in the Nelson and Golden Bay areas that they were quite a pest in early fruit orchards. The red-crowned parakeet has now probably disappeared entirely from the mainland because it fed so often on the ground where it was vulnerable to predation. Good populations exist on many predator-free islands such as Kapiti, Matiu and Hauturu. 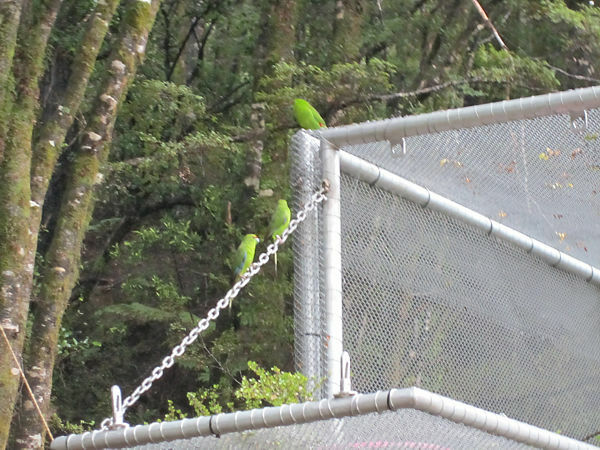 It is the smaller yellow-crowned parakeet that still persists on the mainland and within Abel Tasman National National Park. Just because this kākāriki is more arboreal and has the potential to breed prolifically this is not enough to save it from introduced mammalian predators (ship rats and stoats). 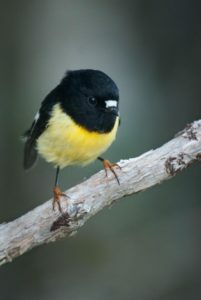 These birds all have the unfortunate habit of nesting in holes meaning that a predator not only cleans up the eggs or nestlings but is also likely to kill the adult female on the nest. In Abel Tasman kākāriki are only ever heard in the high country (Evans Ridge/Wainui Valley/Harwoods Hole) where rats are less abundant and all predators have been reduced by past control operations. There is no doubt in my mind that this slow decline of kākāriki, from huge flocks in the early 1900s to one of the rarest birds in the park today, would shortly lead to a complete loss without management. 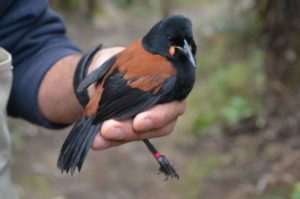 Predators are now controlled through ground-based trapping and periodic applications of aerial toxins which should once again make the park a favoured area for kākāriki. The only difficulty is that these parakeet are in such low numbers that they may lack the critical mass to respond to improved conditions. Who knows, but the few that are heard may all be males! Project Janszoon in attempting to resolve this problem by introducing more birds which can join forces with the locals and go forth to multiply. Fortunately with parakeet this manipulation is quite straight forward: wild adults have been caught from an island in the Sounds and have become founders in a breeding programme. Twelve progeny from the first trial season were released in May but we hope that there should be many more available for release over the next few years. First kākāriki out to see the world.